Throughout my childhood, our family farm in Pennsylvania was not only a summer getaway from city life, but also a place to host extended family and friends. Many times we were allowed to bring classmates from school. One particular friend shared my affinity for horses and was a frequent guest. We spent long summer days playing in the creek, exploring the woods and tending to the horses and cattle on the property, all without issue until one fateful evening when she learned the truth about the origins of beef. 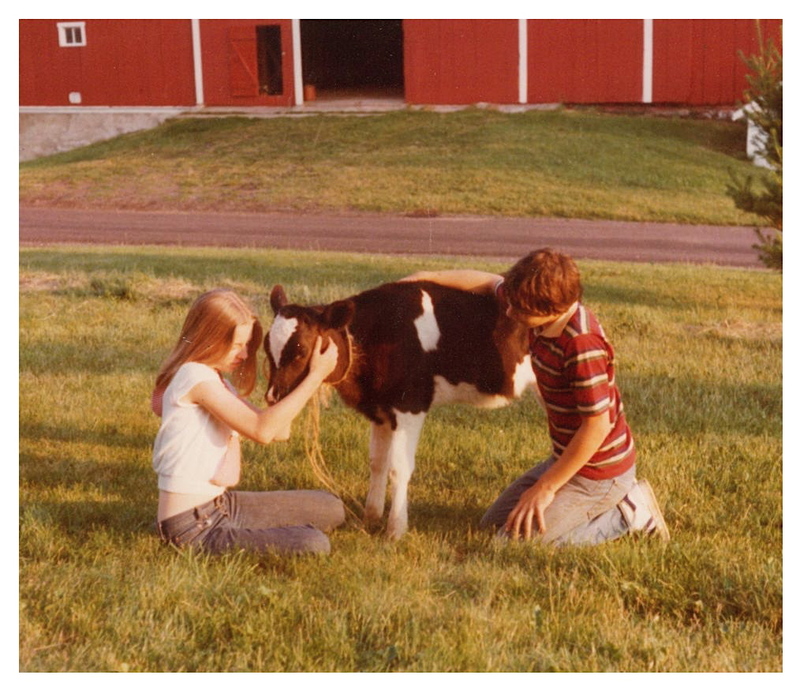 My brother and I with one of the calves we raised at the farm. We were sitting down to dinner, and quite by accident my father revealed the truth…beef comes from cows…and we were having a roast. The chaos that ensued remains vivid in my memory to this day. My friend let out a scream, fled from the table and out into the wilderness, imagining that she was about to consume the calf that we had played with the summer before. In truth, the calf (of milking variety) was grazing peacefully in the neighbor’s pasture. I tried to explain, but there was no consoling her. We all watched, dumbfounded, as she ran up the steep hill behind the house and disappeared into a stand of spruce trees. Now the terrain at the farm isn’t rugged in most places, but it is remote. If you stray too far from the road you could walk for miles and not encounter another house or human for quite awhile. The hills and hollows all begin to look the same and you could pass within a few feet of any number of wild animals and never know they were there. I thought for a moment and then headed out the back door. Judging by the direction she took, I had a pretty good idea of where she was going. I wasn’t so worried about finding her. I was more concerned about what I would say once I did. It wasn’t like a 12-year old kid could do much about beef consumption, right? I climbed the hill and tracked her footsteps through the crushed clover and alfalfa that she left behind on the mountaintop hayfield. I was still contemplating my argument as I reached the summit and looked out into the second hollow. Sure enough, there she was sitting on Table Rock, a big shale formation that cropped up from the valley below, about 4 feet high and 10 feet in diameter…the perfect place to go and think things through when faced with life’s many dilemmas. Just as I began my descent, a flash of black and white emerged from a hole underneath the rock. From my vantage point, I watched in horror as a mother skunk and her babies appeared, one-by-one, as my friend sat on top of the flat rock with her head in her hands crying. Now the problem had gone from bad to worse. I approached carefully and tried to wave a warning, but she misinterpreted my actions and prepared to run again, still clinging to her misperceptions. I inched closer. At this point, I could even smell the danger. Finally, in desperation, I yelled, “skunk” just as she was about to jump from the rock. Luckily, she saw the danger for herself and retreated until the skunk family disappeared from view. The story may seem comical in retrospect, but it has larger implications that mirror a current trend in today’s youth. Our children have become disconnected from nature at a time when understanding the natural world is paramount. We cannot escape from ecological truths, nor can we run headlong into the future without a clear perspective of where we are headed. In the face of ever increasing environmental challenges brought on by climate change, combined with a rapidly increasing population growth due to reach 9.6 billion people by mid-century[i] and an alarming slip in the academic standing of American students on the global stage, we need to seriously reevaluate not only what type of information our students are learning in school, but also how that information is being delivered, in order to utilize valuable class time to the students best advantage and adequately prepare them for the future. However, new challenges have emerged while attempting to raise the bar. How do teachers find enough time in the school day to deliver a 21st century curriculum within a 20th century classroom structure? The reality is…they can’t and don’t. Many schools have eliminated what they deem as non-essential subjects and concentrate only on the subject matter being assessed on standardized tests. Other districts are eliminating recess and reducing the time spent on physical education and outdoor activities…all at a time when children need environmental education, physical activity and exposure to nature the most. As a result, on July 16, 2013, bipartisan bills were reintroduced to the Senate and House that would amend the Elementary and Secondary Education Act of 1965 (ESEA) and require states to provide environmental literacy standards and associated teacher training for students in classrooms PreK through Grade 12. Continuing education for teachers is expected to include educator resources necessary for providing high-quality environmental education, as well as ideas on how to make use of the local environment as an extension of the classroom. However, the problem remains. How do we fit a curriculum expanded to include the objectives of the Common Core along with the NCLI environmental education requirements into an already packed school day and still remain globally competitive? The answer? Why not make use of the technology that we are already using in every other aspect of our lives? We must be careful not to demonize technology in our quest to expose children to the nature experiences we remember from our youth. As parents, if we are honest with ourselves, we enjoy the benefits of technology as much as our children do, and they learn from our example. Electronic devices don’t turn on by themselves. It is our responsibility to monitor the amount and type of media exposure our children receive, just as we mold other time management and social behaviors. In truth, technology and connectivity are making lives better. Take for example the mission of Worldreader, a non-profit seeking to eradicate illiteracy among the world’s poorest people through delivering quality, culturally relevant content by way of a special app available for mobile phones that the majority of these populations already have. The premise of the Worldreader Initiative is based on considerable data demonstrating that education and literacy have the power to change lives and empower people. If it’s possible to deliver quality content to remote areas of developing countries, surely we can use the wealth of digital resources at home to bridge the gaps in our own education system. In my first article about the flipped classroom, I made a case for an emerging educational model where teachers assign the lecture for homework, reserving valuable class time for problem solving and hands-on learning experiences. The beauty of the flipped classroom is that it allows teachers the luxury of utilizing differentiated instruction, providing students with different ways to acquire and make sense of information and ideas. It also allows time for project-based lessons where students can apply what they know to solve authentic problems and produce real results. The flipped classroom structure dovetails nicely with an eco-friendly curriculum by allowing teachers the freedom to engage students in a variety of ways that will get them outside and active, utilizing all of their senses to interact with the environment as motivation and context for learning. In fact, school is an excellent place to introduce nature and ecology… and I’m not just talking about an occasional experiment or an outing on Earth Day. They need to live it and make it theirs. Kids want to feel like what they do and say makes a difference. So if it’s becoming more and more difficult to get kids to nature. Why not bring nature to the kids? It might not be the exposure that we experienced. It might be even better… They can still experiment and play and get their hands dirty. The difference is that their play will take on new meaning. I highly recommend watching the PBS documentary, Growing Greener Schools. The excitement of the children featured in the film left a lasting impression on me. For these kids, school is no longer four walls that close them in for the better part of the day. For them, school has spilled out of the classroom into the hallways where natural light or energy-efficient bulbs kindle a new sense of purpose. It has permeated the school roof, where solar panels help reduce energy costs and free up resources for other innovations. Learning flows out the door and into the schoolyard where open spaces (even urban spaces) can be used for outdoor exploration and experimentation. For these fortunate students, school has become a hub of innovation and collaboration…and above all a source of pride for their contribution to its ongoing success. Edward T. McMahon who holds the Charles E. Fraser Chair on Sustainable Development and Environmental Policy at the Urban Land Institute (ULI) in Washington, D.C. explains what makes a place worth caring about. Green schools do just that. However, as one teacher wisely cautions in the film, kids can go to school in a green building and without the tools to understand the implications of sustainability, they will have no way of connecting the building to the environment or to their daily lives. She compared it to a tree falling in the forest, that no one hears. In order to have a true cultural transformation that will make a significant ecological impact, our schools need to become models of sustainability and use the environment as a context for learning across the curriculum. The time has come for us to stop looking for answers to outdated questions and start asking new questions. Questions like… What kind of citizens do we want our children to become? And, what tools do they need to be successful when facing an uncertain future? It has become increasingly evident that all of us must learn to live as part of earth’s ecosystems, not apart from them. We especially don’t want our children to be caught unaware or unprepared to face environmental issues that are sure to challenge them in the coming years. We want them to be innovators and collaborators that are well versed in the cycles and connections that support life on earth. I believe that using our education system as a conduit for change is the fastest and most pervasive way to improve the eco-consciousness of our country. It is also a win-win situation for our children. It will get them outside and active and will prepare them to think green in a global economy. Oh yes, speaking of food. As for my childhood friend … Fortunately, the cow incident didn’t spoil her appetite for nature. Today, she and her husband live in the country with an assortment of farm animals on their property. However, to the best of my knowledge, she remains a vegetarian to this day. [i] United Nations, Department of Economic and Social Affairs, Population Division (2013). [ii] National Governors Association Center for Best Practices & Council of Chief State School Officers. (2010). Common Core State Standards. Washington, DC: Authors. [iii] Kellert, S. R. (2005). Building for life: Designing and understanding the human-nature connection. Washington, DC: Island Press. [v] McMahon, Edward T. (2012). Character is Key to an Economically Vibrant City. The Atlantic Cities. [vi] Wiland, H., Bell, D., (Producers & Directors). (2010). Growing Greener Schools. [DVD]. United States: PBS. Next postWhat is a Food Desert?